Internet advertising spending first surpassed TV advertising in 2016. That gap was expected to widen by $10 billion in 2017. With so much of your brand’s marketing budget likely going to online advertising, it is essential that you use it in the most effective manner possible. To help you get the coming year off to a successful start, we sought the advice of experts in the digital advertising field. 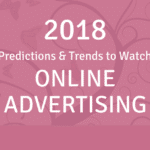 Check out these insightful predictions about online advertising trends you should be aware of in 2018. “Data will become about leaner, cleaner lists as emailers begin tightening opt-in procedures. Process-wise, the continuing rise of automation for all email marketers right down to microbusinesses. It is now available with even the lowest cost services and working with smaller businesses those marketers are looking to drive timely, highly relevant communications more than ever with the use of automation processes. Brad M. Shaw, President and CEO of Dallas Web Design Inc.
“2018 is going to be the year when the 16:9 ratio that we are comfortable with from television is going to lose its stranglehold over digital. Already data is showing that vertical video engages more people on mobile and social media. But frankly, just looking at your distribution channels and thinking about what is right for them is not enough. How about the content itself? “According to a Kenshoo study, 56 percent of consumers start product searches on Amazon. That means a minority of consumers are starting product searches on Google. That is a major shift that has been in the works for the past decade. Kent Lewis, President and Founder of Anvil Media, Inc.
“The powerful combination of paid social media and paid search is where the vast majority of digital dollars will be spent next year. “More money will continue to shift into paid social media as these platforms grow in importance, user-base, and sophistication… if I have 100 followers, 2-5 of them will actually get served my content for free. If I want to reach the rest, I’ll have to pay. “While this may seem ‘unfair,’ social platforms like Facebook, Instagram, LinkedIn, and Twitter have amassed large user bases and have very sophisticated audience targeting tools. Brands are not walking away anytime soon. These communities of brand advocates have taken years to build and brands will spend an increasing percentage of budget toward reaching their followers. “Two quick things to keep an eye on as we head into 2018 as it relates to content marketing and influencer marketing. “Authenticity – while influencer marketing continues to be a buzzworthy topic in terms of content marketing, social media promotions, etc., issues arising from things like the failed Fyre Festival, have raised issues on transparency and authenticity. “If brands and agencies are using influencers for content marketing but they are not believable in the space, the risk of losing creditability and fans is real. Look for an increase in transparency regarding endorsement/paid influencer deals, with a focus on more of a natural tie between the influence and whatever it is that they are endorsing. “I believe that the adoption of programmatically purchased and delivered media will continue to grow and display advertising will eventually become 100 percent bought and fulfilled using programmatic real-time bidding technologies. Programmatic media buying is the algorithmic purchase and sale of advertising space in real time. During this process, software is used to automate the buying of media inventory via an auction. “I believe the biggest development in 2018 regarding programmatic advertising will prove to be two things. One is ads.txt, which is an initiative created by the IAB Tech Lab that will serve to very substantially reduce fraud in online advertising, and will as a result also create fair value for media in the programmatic marketplace. “Ads.txt enables publishers to publicly declare the companies they authorize to sell their digital inventory. By creating a public record of authorized digital resellers, ads.txt will create greater transparency in the inventory supply chain, and give publishers control over their inventory in the market, making it harder for bad actors to profit from selling counterfeit inventory.